When you’re a huge foodie like I am, farmer’s markets are a danger zone. In a good way. You know how it goes: you walk around with one or two purchases in mind and wind up leaving with a bag stuffed full of things you weren’t there to buy. But suddenly, when you saw them, you needed them. That happened to me with a bunch of beets at the Troy farmer’s market the other week. I’d been thinking about beets and when I saw bundles of really big ones at one of the farm tables, I snatched up the nicest looking group I could find. As much as I like beets, I like library books more. Seriously, I’m lucky that the local branch doesn’t charge for interlibrary loan or I’d be broke all the time. One of the things I have a habit of requesting are cookbooks. Since they tend to be on the pricey side, I find it pays to check them out first if possible. This has a tendency to backfire on me when I do a sweeping search through the entire library system catalog and find things I didn’t know existed. Such was the case a while back with Robin Robertson’s The Vegetarian Meat & Potatoes Cookbook . I’ve had that one out before, and it was so awesome that I requested it again recently. 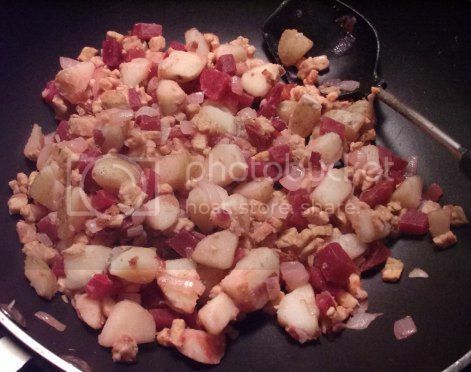 Just like the title says, it’s a book of vegetarian and vegan versions of classic “meat and potatoes” dishes, including this red flannel hash. 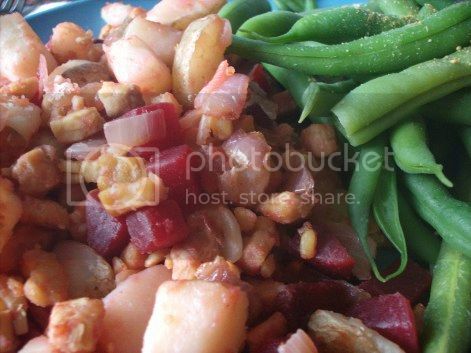 I’d never heard of red flannel hash, but it sounded like an interesting way to use beets. Plus it has potatoes in it, so what’s not to love? The recipe involved steaming potatoes and boiling beets, one of which I’m adept at and the other I’d never done. (I should probably also mention that I’m adept at forgetting to check the water level in pans where veggies are steaming. This has created some incidents I ought to be able to look back on and laugh at in the future. Maybe.) I either didn’t use enough water or didn’t cut the beets small enough, because they seemed to take an inordinately long time to get soft. 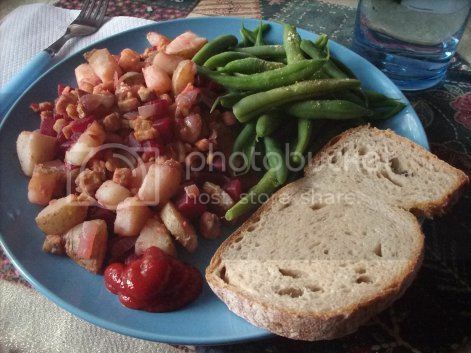 It worked out all right in the end, though, and it turns out that hash makes a pretty darn good dinner with some green beans and fresh French peasant bread on the side. I wish I could say I made the bread, but that distinction goes to Our Daily Bread in Chatham, who are at the Troy market a lot and bake several vegan-friendly breads. Tempeh was the “meaty” component for the hash. I cut it up in tiny pieces instead of grating it. The idea of grating tempeh has always seemed kind of messy to me. Does anyone else grate tempeh for stuff? If so, how does that work out? It seems like something that would be better for cold faux meat salads. As a way to use beets, this hash was a good idea. They added a bit of sweetness to the potatoes, and the whole thing would make a good side dish to tofu scramble or some kind of vegan frittata. You could also eat it on a big bed of steamed greens; chard or kale would work well. Then again, kale is awesome with anything…I almost made that instead of green beans!